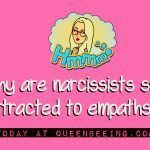 If you’ve ever been in any sort of relationship with a narcissist or someone with narcissistic personality disorder (NPD), did it ever occur to you that they seem to treat people like they’re not really “real” or as important as they, the narcissists, are? 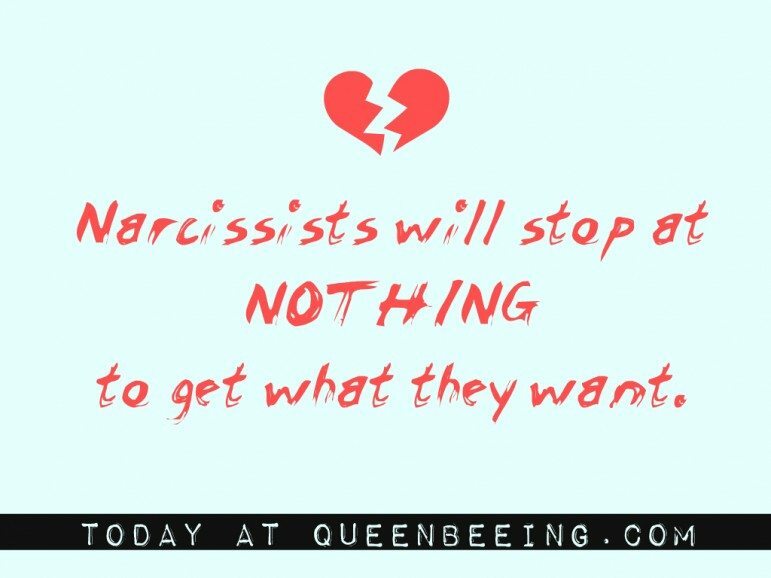 It’s a common red-flag symptom of NPD, and it’s one that many victims and survivors of narcissistic abuse and gaslighting in relationships report: they feel like they don’t matter; like the narcissist made it clear to them that they aren’t actually important. If you’re struggling with this kind of abuse now, you probably get what I mean – that feeling of feeling like you are always sort of “faking it” and like you don’t even really believe yourself when you talk. Quick side bar? That’s a form of disassociation and it’s a common symptom of PTSD and C-PTSD, which are unfortunate but all-too-often seen side effects of this type of abuse. Disassociation is a disconnection from your physical surroundings. It’s when you feel like you’re sort of watching the world from somewhere deep inside your head, or above it or somehow disconnected from it. Like you’re “not really there” or like you’re watching life through a movie. You know what I’m talking about? The worst part about how narcissists treat people like possessions is that there are no limits to who they will use to get what they want – and no limits to how low they’ll stoop and who they’re willing to hurt. Narcissists treat people like possessions. There are no limits to who they will abuse to get what they want. 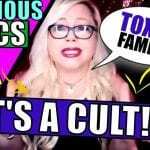 The most toxic narcissists are even willing to go as far as hurting their own children – using them as pawns in their gaslighting mind games and even completely ignoring their existence as long as it suits their purposes. Narcissists will go as far as using their own children to get what they want. I present to you a real-life example of a narcissist father who uses his two daughters and their mother as pawns in his manipulative gaslighting games. This is the story of two little girls; we’ll call them Sally and Cally. They are half-sisters, these two, and they’re only a month or two apart. Their father, we’ll call him Jack, cheated on Sally’s mother (let’s call her Sue) with Cally’s mother (we’ll call her Ann), according to Sue. According to Jack, he and Sue were “on a break” when Cally was conceived. All Ann knows is that she got pregnant thanks to an encounter with Jack and that she gave birth to Cally as a result of it. Days after Sally was born, Sue catches wind of Ann’s pregnancy and imminent due date. She confronts Jack, who initially denies it but somehow convinces Ann to lie about it if Sally should confront her directly. When Jack is finally confronted about this in public, he gets angry and loses control – he thinks everyone has turned against him and he watches in horror as his elaborately built house of lies tumbles down around him as the truth about his ridiculous behavior spills forth into his circle of friends and family. Everyone finds out that Cally exists and is shocked at the resemblance she bears to Sally. Not only that, everyone learns that Jack has never even so much as met his slightly younger daughter and that he has no intention of doing so. He says its due to stress and negativity in his relationship (or lack thereof) with Ann, but in reality, it’s just because Cally doesn’t serve a need in his life at this moment. He feels completely justified in his discarding of his own flesh and blood because of the negativity in his relationship with her mother – completely disregarding the fact that his daughter is not a possession but an actual human with actual needs and a real live soul. In the meantime, as his relationship with Sue inevitably erodes in light of this information, Jack cannot help but implode as she understandably recoils and pulls away on an emotional level. Even as she tries to protect herself from his gaslighting and manipulation, he tries again and again to use their daughter Sally against her. So, just as he’s completely denying the existence of one daughter, the other is only used as an attempt to manipulate the woman he wants to possess – call his own, who at that moment, happens to be Sue. As the situation grows in intensity, Jack starts desperately seeking a flying monkey – he calls and texts everyone he knows, trying to figure out who’s on his side – who’s really his friend. And of course, which ones might sleep with him (you know, to take his mind off the stress caused by that “evil Sue” – Sally’s mom). And speaking of Sue, it’s all he can talk about – how horrible she’s been to him, how she’s “keeping his daughter” from him. Meanwhile, Sue’s looking for a new babysitter because Jack has said he will no longer take care of Sally while Sue’s at work – just another attempt to control her, of course. All of this, of course, is Jack’s desperate attempt to retain control of what he wants. The women and the children in is life are pawns and nothing more – they are treated more like possessions and less like people. Read this real-life example of a terrible narcissistic father. Does that sound like someone you know? Please tell me about your experiences and what you think about this story in the comments. If you or someone you know is dealing with this kind of abuse, you might want to download my free Post-Gaslighting Emergency Recovery Kit or visit this free resources page for more help and support with gaslighting and narcissistic abuse in relationships. This is an excellent article. 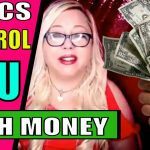 It kind of sorts out the craziness and chaos a narc creates in a relationship. The chaos and manipulations are tactics to keep you side-tracked and busy questioning yourself so that you never take a good look at him/her. I was raised by a narc mother and then had multiple marriages all to narc men. I am in my 50’s now feeling exhausted with life. I just feel like I’ve had every manipulation, gas lighting and awful narc tactic shoved down my throat for my entire life. I know…I am supposed to move forward with confidence that this will never happen to me again. It’s a lot easier said than done. How do people in my shoes pick up the pieces and build self esteem, confidence and energy for life again after all this? It would be great to see some progressive material with actual ways and examples of how to rebuild self esteem again. I know I had it once. I refuse to have another relationship with a man until I am confident I won’t fall for this again. I am also a very strong empathy…it began as a child that I could feel other peoples feelings. I also had strong urges to fix things for people in life….another draw back. I developed all of this so well that I am almost psychic. I am getting that piece of me in perspective…trying to get back to the gym and eat healthy so I feel healthy. I am alone a lot due to our friends believing all his lies….I can make friends I know this. I do have trouble trusting people now. It would be great to have guidance and direction with all of this. Thank you for your work in this area…it has been so needed for so long! Hi Nansie, and thank you so much for the comment. I am so happy to hear that you found some use in it, and I totally agree that we need more material on how to rebuild your life again after one of these relationships. I’m actually working on a series about that and am nearly finished with a book on the topic – so stay tuned for that. In the meantime, maybe one of these will be useful for you! Rediscovering Yourself After Narcissistic Abuse: Do you believe what you think you believe? You can also look at the coaching programs and the “PERK” – Post-Gaslighting Emergency Recovery Kit at http://narcissismsupportcoach.com – the kit is free and so are most of the resources on the site. Hugs and love and thank you again for sharing your experiences and your thoughts. I have a similar story so to speak.. I was with a guy who even lied about his name. He went by “Jr” yet his real name was Hubert. He had an ex wife w two kids. Jr and I dated and eventually built a house lived together for two years. During this time there were highs and lows(extremes!!) we broke up several times yet he always would win me back with saying he knows he s messed up and if from his past he s sorry etc and I always believed he had changed. We talked about marriage-we looked at rings but then he came up w an excuse as to why not to get married. (Side note he told me to go ahead a buy a wedding dress which I did). We also talked about having a child and decided let s even though we weren’t married. After 6 months we conceived. When I told him he kicked me out told me to get an abortion and that was it.. So I thought.. Once again throughout my whole pregnancy he would come back into my life then break up w me about something.. Bc everything was always my fault my issues etc. So we have a daughter who will be 2 this summer. He s had no real part in her life. His other 2 kids don’t even know they have a half-sister. His friends do bc of Fb… And just that people are aware of the situation (even though he s lied to them about what truly happened) his story always changes. I finally filed for child support when our daughter was a year bc I wanted him to be a dad, but he hasn’t. Now he s told me bc of child support I have prevented him from wanting her. It s all my fault. I did this I ruined his life. I created this situation and he never wanted her etc etc. He would bombard me w flowers notes emails tell me he was in therapy to win me back which worked but I’ve finally disconnected we re over for good. So here we are today, his daughter will be 2 this summer. His other children who don’t know why I wasn’t there living w them all of sudden won’t know of their half sister.. And he keeps coming across to new people that he only has 2 kids he s a great good looking guy etc etc here s the real kicker–I found out he was married 2x only after we broke up. This man has done so much damage to me emotionally. 4 1/2 years of on and off w him. He would scream and yell at me say the meanest most hurtful things but then in another month “apologize” and win me back. Finally no more! His daughter and I deserve better and everyday I’m trying my hardest to stay positive to believe in karma and to keep moving forward. Wow, Liz, that sounds incredibly similar and exhausting! I am so happy to hear that you and your daughter are moving forward together and I hope you find a beautiful new and more peaceful life! Hugs and love to you. Stay strong and remember that you and your little girl deserve the very best – aND from now on, accept nothing less!